… some other spicy ideas? Another discovery of peperoni in advertisement. 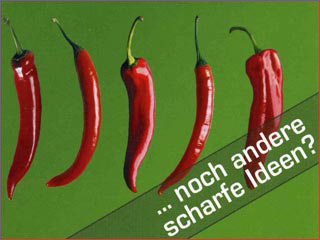 This time as an spicy postcard from the business plan competition „der aachener gründerwettbewerb„. It’s a free postcard from the company Parfum Point Marketing GmbH designed by Birgit Ackermann from anotherpixel. They distribute this postcards through pubs, coffee bars, restaurants and places of cultural interest among youth.